Ahead of the inauguration of the 9th Senate, there are allegations that Senate President, Dr. Bukola Saraki, is already putting in place, machinery to ensure that he influenced who emerge as the next Senate President and the deputy. According to the source, the group's Plan A is to sponsor one of them for the position of Senate president in the event that two or more members of APC caucus present themselves for the position on the floor of the Senate. 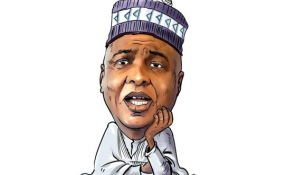 It was also gathered that Saraki was working on a fall-back position, having lost his re-election bid for the Kwara Central senatorial seat, just as he had planned to take a shot at the Senate plum position but, unfortunately, he was defeated at the poll by APC's candidate, Dr Oloriegbe Ibrahim. It was also gathered that Plan C of the group in case Plans A and B fail, is to support another APC senator from Yobe State, who they believed would not act to adversely affect the group's interests. Largely unsettled by the plot by the Saraki group, members of the APC caucuses in the National Assembly and in the party's hierarchy in Abuja are now inclined to deliberately cede all presiding and principal officers' positions in the Senate and House of Representatives to zones where they could accommodate and endorse predetermined party and president's loyalists for election/selection. According to a source, the party's National Working Committee, NWC, had already been activated to mobilise concerned state governors and leading party stalwarts to ensure that the leaderships of both chambers comprise identified loyalists.